I'd like to use PouchDB with CouchDB because of the great syncing and replication features for my web app but have a difficult time finding the best way to model my data for what I need to do. The app lets a user create events in a calendar which can be shared only with users they choose. The users that are associated to that event can add comments and make changes to that event. 1) So far from what I understand, each user should have their own database to avoid accessing other user data if all stored in one db. If this is the case, how would one update or share a documents data from different databases? 2) Should the user login be managed on another server using an sql database with an API? If that's roughly right, then I'd propose the following architecture to make it work with PouchDB & CouchDB's replication. In the flowchart below, you can see Alice's "device" (or app, etc) on the left. Alice keeps events in a private-user-space database. Any event document (like the one above) with attendees on it, gets copied (possibly via a background, filtered replication process) to share databases based on the user identifiers used in the attendees key (or however you model your stuff). Each of those share-with-* database is continuously (ideally) replicated to a cloud-hosted (most likely) CouchDB (or compatible) database. 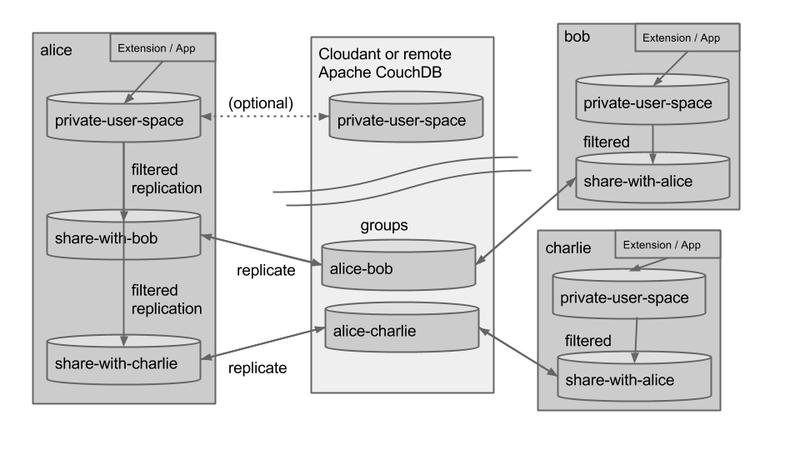 Bob and Charlie have their apps connected to the same cloud-hosted CouchDB (or compatible) database, and get Alice's event replicated into their share-with-alice database. The app then provides those events to Bob and Charlie, let's them make their edits, replicates those changes back to the share-with-alice database, and then (eventually; because network) back up to the cloud and back to Alice. In all of this, the cloud bit is optional. ;) Depending on the deployment these could be three devices on the same network finding each other someway or other and replicating as available. From what I understand of your app, this should work. :) You mentioned that there are other comment documents also, and they'd need to be modeled in a similar way--or the app would leverage their relationship with the event document to do the Right Thing with the related comments. I'd be very curious to know if this sounds like a possible path as I'm exploring it myself for a few projects. Probably the easiest thing to do in this case would be to assign roles and use the "one database per role" model (as opposed to the "one database per user" model). You don't need a separate database for this. CouchDB can handle it just fine. However, you will need some server-side logic to manage the user permissions, assign the roles, etc. If an event can have any combination of users, it sounds like you may have to do something like "one document per role," which translates to "one document per database." That might be unfeasible if you expect users to create a lot of documents, but keep in mind that you can always sync multiple remote databases to a single local database (or vice versa, or any combination you want). Good luck! Not the answer you're looking for? Browse other questions tagged couchdb pouchdb or ask your own question. CouchDB's replicated DB is a copy or reference to original?